Property Size 2,157 sq. 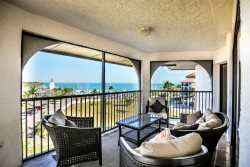 ft.
Oceanfront Penthouse Condo with a Private Boat slip. Small Gated Community on the southern tip of Islamorada. The condo has a designated 4 car covered parking. Quick boating access to the Ocean or the Gulf of Mexico thru the Channel 5 Bridge. The beauty of the bridge can be seen right from the condo balcony, there is the Sunrise over Channel 5 in the wintertime. This unit is one of only 4 units in the whole complex that are true flat, meaning no stairs. This is the penthouse unit It is accessible by Elevator and is right off the pool area. Spacious with 1800 sq ft of living space. There is Ocean views from all living areas and Master Bedroom. Balcony has lots of seating, and is facing the ocean. This condo is very well equipped and a well stocked kitchen, and a Barbeque! TV in every room, with a split floor plan. The master bedroom has access to the Oceanside deck, it has a king size bed, and private luxury bath. The other two bedrooms share a bath. One bedroom has a King size bed and the other has two twins. There is an additional trundle bed in the living area that sleeps 2 if needed. We look forward to having you create your own family memories, as our family has done for generations. Must ask agent if dockage has been repaired. Get your Great Escape started and contact us now. Sea Bird MARINA Due Boat Rentals and will have the Boat Docked for free as long as you have rented the boat for.